I can't believe that I haven't posted to my blog for almost an entire year! Where has the time gone? Where have I been, what have I done for the past 347 days! I don't know, but I have so many delicious vegan recipes that I want to share with you so hopefully this will be one of many more to come in 2014! Also, it is cold in the Bay Area! What is up with the weather? It was 75 degrees the day after Thanksgiving and now it's hovering around 45 during the day and below freezing at night. I know that it's winter and all but there is a reason why we live here...mild temps! To keep warm this past week we've been eating a lot of comfort foods and nothing hits the spot more than a big bowl of Spicy Korean Noodle Soup! When I make soup I really don't measure--I just throw a bunch of ingredients in the pot, season and simmer. So my measurements are not exact but the soup will still be delicious. And if you don't have all the ingredients, no worries--we have ways to improvise! One of my favorite foods to eat right now--actually, I'm addicted to it--is raw, vegan Kimchi. There are several brands you can find in the specialty market, but my favorite is Wildbrine. It has a beautiful red color from the Korean red pepper paste (Gochujang), subtle heat and a refreshing tang from the fermentation. If you can't find Kimchi and don't have time to make your own (which I plan to start doing), then just add shredded Napa cabbage to the soup along with a tablespoon of Bragg's Organic Raw Apple Cider Vinegar. The hardest ingredient to locate if you don't have a Korean/Asian market close by is the Gochujang to make your paste. Be wary of purchasing already made red pepper paste and check the ingredients closely because most contain fish or shrimp sauce. But if you find the powder then it's easy to make your own paste for the soup base--you just add a little oil to the powder, mix and you're all set. Unfortunately, you cannot substitute cayenne or crushed red pepper in place of the Gochujang. They have a totally different type of heat. The Gochujang has an earthy heat that you can build on, where as cayenne would be too hot. This recipe serves two to four depending on your serving size and it can be served with wheat noodles, rice noodles or brown or white rice. I used Korean hand cut fresh noodles purchased at the Korean market. One plus about living in the Bay Area is that within 3 miles of my house I have just about every type of ethnic market you could ever ask for! Makes cooking and trying new recipes very easy! Add all ingredients to a five quart pot, bring to a boil and simmer for about 20 minutes. Before adding the other ingredients, remove Kombu. Add red pepper powder, along with oil to a small bowl and stir to combine. If you don't like heat, start out with 1 Tbsp. You can always add more to the soup while it is simmering. Cook noodles according to package directions, rinse under warm water and drain. 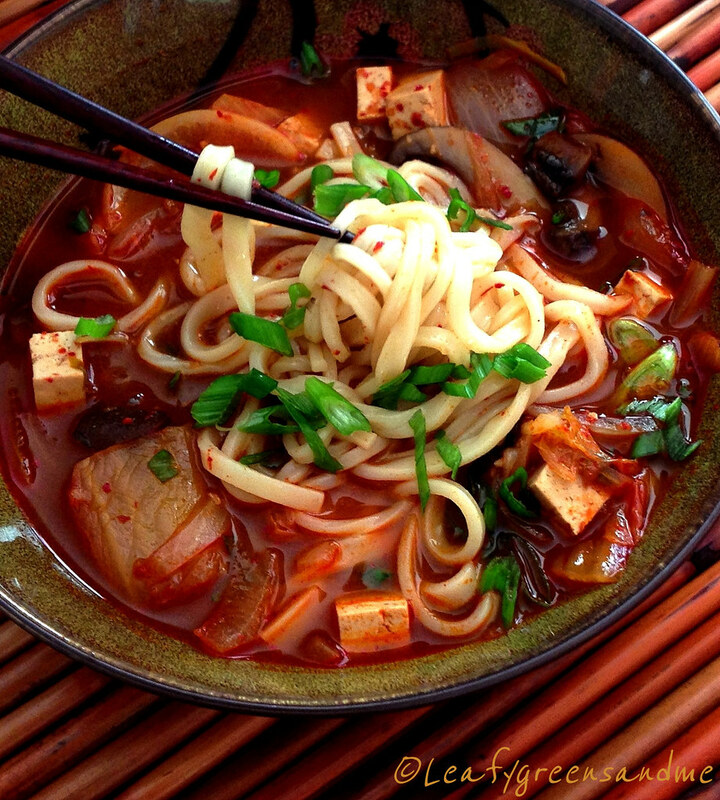 Remove Kombu and add sliced onion, tofu, red pepper paste and kimchi. Bring to a boil, reduce to a simmer and cook for 15-20 minutes for flavors to combine. Five minutes before serving, add radishes or turnips and season with salt to taste. Place noodles in a bowl and ladle piping hot soup over noodles and garnish with green onions.